Click here to visit the Jimmy Kimmel facebook and like them. Then on the “Swag Sweepstakes” tab, scroll down and fill out the form to enter their sweepstakes. There will be a total of 150 winners that score a free prize. You can enter daily through October 8th. Good luck! 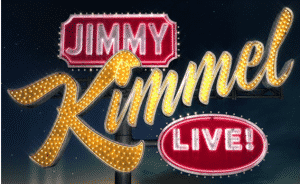 Grand Prize (3 winners – 1 Grand Prize winner per Sweepstakes Period): Each Grand Prize winner will receive one (1) of the following Jimmy Kimmel Live! items autographed by Jimmy Kimmel: one (1) Jimmy Kimmel Live! two-tone T-shirt (ARV $25.00); one (1) Jimmy Kimmel Live! two-tone black mug (ARV $10.00); or one (1) Jimmy Kimmel Live! Hat (ARV $22.00). First Prize (147 winners – 49 winners per Sweepstakes Period): Each First Prize winner will receive one (1) of the following Jimmy Kimmel Live! items: one (1) Jimmy Kimmel Live two-tone T-shirt (ARV $25.00); one (1) Jimmy Kimmel Live! two-tone black mug (ARV $10.00); or one (1) Jimmy Kimmel Live! Hat (ARV $22.00).